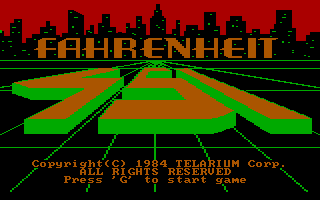 This week, we're looking at a Telarium/Trillium adventure adapted (loosely) in 1984 from Ray Bradbury's dystopian 1953 novel, Fahrenheit 451, about a world where books have been made illegal in a woefully misguided attempt to preserve social harmony. To limit the scope to something that works in a game, the story picks up near the end of the novel along an alternate storyline, with a new introduction by Mr. Bradbury and a more optimistic ending. Byron Preiss Video Productions, Inc. developed the game, with technical direction by Lee Jacknow, writing by Len Neufeld, programming by Michael P. Meyer and illustrations by Robert Strong and Brian Humphrey. I'm playing the IBM PC version, which features 4-color CGA graphics apparently converted from the Commodore 64 version, with wider pixels than the PC norm. The graphics looked much better on other platforms, but the PC version does its best, shifting its palette when the red-blue-white color set fits the artwork better than the red-orange-green palette. It also plays music and sound effects, sort of, using the original PC speaker to generate simple monophonic tones. 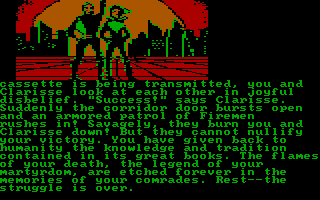 The player is cast as Guy Montag, a former Fireman and protagonist of the original novel; the adventure begins as he tries to meet up with the literary underground seeking to restore literature (and, by extension, ideas, initiative and freedom) to a world where Firemen are called upon only to burn books and the homes containing them. Fahrenheit 451 is a flawed but engrossing piece of interactive fiction. The game's world is limited to a handful of city blocks, but is richly detailed, depicting an alternative American history that is sometimes amusing, sometimes horrifying. Character interaction is well-handled; conversation is minimal, but the Bradbury-esque prose and use of literary quotes as passwords brings a variety of interesting human beings to life. The game takes itself, and its inspiration, seriously, and that is to be commended. 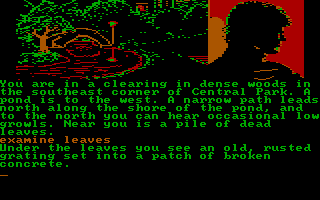 As the game begins, we find ourselves standing in New York City, in Central Park, near a suspiciously adventure-ish pile of dead leaves. The grating is indeed the most desirable path to take; our only other options include getting dragged underwater and killed by some unseen creature in the pond in the park, or being fatally mauled by a roaming tiger along the path to the north. The tunnel below our starting location runs infinitely to the northwest, though it's nicely handled -- we can walk indefinitely, but find ourselves being accosted by more and more creepy-crawly bugs, distasteful but not fatal, as we head away from civilization. Once we turn back to the southeast, the game brings us back to the point beneath the ladder immediately and saves us the long trudge back. In any case, it's best to head into town to the southeast. The biggest problem I ran into with Fahrenheit 451 is that its world is almost too naturalistic and open, and some technical issues surface early on. Some crucial events, like meeting the man from the Underground who approaches us at the fountain and provides several important bits of information, occur only once per play session, can be missed if we take a route that bypasses the rendezvous point, and will not recur after an in-game restart. Other important moments are random, time-dependent, or rely on a subtle clue that may only be apparent as such after the fact. The design does its best to compensate by providing alternate pathways and multiple means of discovering the most critical password quotes, but the approach still makes for problematic play at times. The most useful thing we (should) learn from the fountain encounter is that a lighter will let us signal fellow members of the resistance -- "make a little light so we'll know who you are." We can obtain such a device in the nearby hotel. The man also tells us to "Enter the building at E48-49, find the speaker, and SAY 'IT WAS A PLEASURE TO BURN'," breaking the game's reality a bit by quoting the first line of Bradbury's original novel. He also tells us to make sure we obtain a new mask, chemindex and fingerprints so we can adopt new identities to pass checkpoints; this is the game's central puzzle conceit, and most of our time will be spent tracking down the appropriate technology and paperwork. The main obstacle on our way to the story's climax is the barricaded post at the Main Library. There are similarly secured facilities elsewhere, requiring hand, fingerprint or visual ID for entry. In my initial foray, I completely missed meeting the man at the fountain, so I was left to explore the world without any real idea of where to go or what to do. I discovered that there are many ways to die -- Bradbury's fearsome Mechanical Hounds and roving squads of Firemen prevent us from crossing the street safely, so we must find an elevated walkway to get to the east side of the avenue. There are also many establishments to visit -- we can eat at a restaurant to fight off hunger pangs, get treated at the hospital (SAY "I'M SICK" to the admitting nurse), visit the Walls Parlor where disinterested citizens watch giant television screens, explore deserted buildings, and get arrested and killed anytime we are asked to produce ID. Once we have the lighter, the world opens up a bit; in fact, so many citizens are furtively helpful after we pointedly USE LIGHTER that it begins to seem like the Underground would easily outnumber the Firemen, if only we could get organized. If this is intentional, it's an impressively subtle reinforcement of the novel's themes, but I suspect it's just a side effect of adventure game conventions. The hotel contains the PHANTASYPHONE offices, where we can don a virtual reality helmet and pretend, briefly and non-interactively, to be a spiritual leader or mountain climber behind two of the three available doors. The hotel guard downstairs will quietly inform us that the attendant "is" (that is, has memorized for posterity) the works of Lewis Carroll, and we should give him the first line of Jabberwocky. We SAY "'TWAS BRILLIG AND THE SLITHY TOVES," and he lets us into the mysterious room to the west, where the PHANTASYPHONE headset presents a vision of our young friend, Clarisse McClellan, who is alive (in the game), dressed in white and urges us to find her, though she provides no concrete information as to her whereabouts. Later, other characters will mention seeing a woman in white inside the 42nd Street Library, now a maximum-security repository of all officially-permitted books. The parser isn't too hard to deal with, as few special-case verbs are required, but it's limited just the same and takes some getting used to. I immediately discovered that we must EXAMINE LEAVES -- SEARCH LEAVES doesn't work, and LOOK LEAVES is treated as a room-level LOOK. The engine also has a habit of giving us significant details only on our first encounter with a new location or person, so if we didn't pay close attention we won't get much information from the terse descriptions provided afterward. Another minor annoyance -- READ SIGN often reports That is not possible. The design generally gives us the text as part of the room description, so it's not really necessary, but it's a bit jarring on occasion. Fahrenheit 451 is not very puzzle-y in the traditional sense, but it has a very nice sense of its world, and there's a lot to explore that's not directly germaine to the plot. I always think science fiction works well in the interactive fiction medium, moreso than fantasy, because it's generally about plausible variations on the world we know -- experiencing an alien environment and learning to understand it is always a lot of fun, and it works very well here. Bradbury's circa-1950s futurism holds up pretty well, too, although there are a few odd notes -- in the hospital, the nurse busies herself receiving and answering message capsules through pneumatic tubes, a function usurped by email in future reality; and we obtain a map encoded on a plastic wafer that unfolds and hovers, a novel device that's no match for 21st century GPS technology. The hotel lounge contains a number of storage lockers -- we need a tetrasonde to open them, whatever that is, and I never found one. There's also an older gentleman present -- if we TALK MAN, he asks us to follow him, giving us a brief tour of the city in passing before he leaves us standing outside a locked building after he enters a code and vanishes inside. We can do this repeatedly, as he will reappear in the hotel lounge by the time we get back, but I never figured out why this is possible. We can USE LIGHTER in the magazine store to visit the back room, where a selection of contraband print works are secretly available: the Bible, Shakespeare, Machiavelli, Plato, and Thoreau. The clerk advises us to meet the author of The Phoenix and The Turtle, i.e. Shakespeare; the only useful quotes the game will mention here are in the Bible and the Shakespeare books. In the subway station, if we WAIT repeatedly, a train repeatedly roars into the station and grinds to a halt. I never figured out what we were supposed to do in the subway, either, though I did manage to get arrested there. The interrogation, in my case, established that my physical characteristics did not match my fake ID, and I was summarily executed. In the hospital, I eventually figured out that, instead of SAYing simply "I'M SICK", we get some additional information if we quote the Bible in a similar vein: SAY "STAY ME WITH FLAGONS, COMFORT ME WITH APPLES: FOR I AM SICK OF LOVE." The nurse will hint that we can enter official buildings if we assume a maintenance man's identity, and find food at the government food center (although we will need proper ID in practice.) Either way, we meet Dr. Foster, and if we utter the first line of a classic nursery rhyme learned from the mute man in the cathedral (SAY "DR. FOSTER WENT TO GLOUCESTER"), he will use his chemindexer once on our behalf. After he leaves, we can and should pick the cabinet lock with the paper-clip found on the floor and take the chemindexer with us for future adjustments. Fahrenheit 451's Navigation is more story-driven than the traditional adventure game -- we often need to ENTER BUILDING, but once we find our destination LEAVE ROOM usually takes us all the way back outside to the street. Several phone booths line both sides of the avenue, but we can't USE BOOTH or GO BOOTH, only ENTER BOOTH works. And one area seems like a trap at first -- we enter through a window, and must EXIT WINDOW to leave, even though the description doesn't mention the window once we're inside; experimentation establishes that we can't LEAVE or ENTER WINDOW or CLIMB WINDOW or GO WINDOW or navigate W/S/E/N/U/D to return to the street outside. Some buildings are only open at certain times of day -- we can WAIT or SLEEP to accelerate the passage of time. WAIT always works, even though under some circumstances the game will tell us we Can't do that here even as it allows time to pass. There's a tall skyscraper with an observation deck, apparently just for atmosphere, but if we use our lighter and SAY "RISE UP, MY LOVE, MY FAIR ONE, AND COME AWAY" to the elevator operator, we can learn some new information about the Magic Shop and get the phone number of one Emile Ungar: NYC-802. We are instructed to quote the last line of Alexander Pope's An Essay on Man when we contact him. Like Telarium's Amazon game, this one occasionally forces the narrative a bit; some areas nudge us along by saying things like You realize that there is nothing here for you. In the restaurant, You decide that before you try to do anything, you'll wait for your meal, and when we talk to a rambling old woman in the bank, it forces us eventually to nod and walk away (after we learn, secondhand, that her daughter has spotted Clarisse inside the Library). But a good balance between description and interactivity is generally maintained. The Jewelry Emporium, operated by a nicely-portrayed snooty clerk, offers a stickpin, a flashlight ring, and a calculator for sale. We can buy a ring, which can be engraved with initials -- but I found no reason to choose specific initials, and the ID we start with has a random name that varies from game to game. The important task here is to visit the engraver, another member of the Underground, and quote Shakespeare and Emily Dickinson to him, earning a coveted Library permit. The game provides a solid sense of a literary Underground, with constant threats and occasional aid. We can CHECK ID to confirm identity, chemindex and fingerprints at any time. We start with a fair amount of cash on hand, but eventually need more. The clerk in the bank officially requires a bank card before he will deal with us, but if we give him a Shakespearean quote about money, he'll give us an ATM card we can use at the cash machine. The funds allow us to purchase a contraband fingerprinter, allowing us to match our fingerprints to our current ID. I needed to reference a walkthrough to enter the intriguing Magic Shop on the east side of the street. We can't get past the padlocked gate... unless we use the lighter to BURN PADLOCK. Here, a bizarre array of automated masks allows us to change our face, again to match our adopted identity. I entered the dark alley off of location E47-48, but only found a trap door that leads to a tunnel -- the ladder breaks free, and the tunnel below does not seem to be a maze. All I discovered here is that we can wander endlessly until hunger takes over and we pass out, ending the game. An establishment called Glass World contains a beautiful but confusing optional side trip involving a walk-in crystal -- a friendly robot gives us some glasses to aid navigation, but we still can't EXIT, and must instead LEAVE CRYSTAL. We can examine a glass sculpture here that shows a woman in a white robe entering the 42nd Street library, useful if we haven't encountered some of the other Clarisse-related clues. I enjoyed several alternative-history cultural references -- a mural in the Square Room dates from the 1930's Works Progress Administration, and New York's esteemed Tiffany's is now a museum, open 10 AM to 8 PM. The letters are just backwards, in unscrambled word order, so no real decoding is needed here. The fountain near the hotel contains special water capable of washing off radioactivity, but only lets us do it if we really need it; I never encountered a scenario that required doing this. Following the advice given early on leads us to a red phone in a secret room that gives us permission to call the mysterious "Ray" (Bradbury, I wonder?) at NYC-154 from any phone booth. If we remember and repeat a quote from William Blake, i.e. SAY "SOME ARE BORN TO SWEET DELIGHT. SOME ARE BORN TO ENDLESS NIGHT. ", we can call him up and ASK about various authors and works to obtain quotes. Some of the information can be learned elsewhere, but several quotes seem to be available only from Ray's helpful phone service. We should visit the cathedral before seeing Dr. Foster, at least if we hope to understand what's going on. A mute man with a red nose and large ears will respond if we USE LIGHTER to get his attention. We can then SAY "GIVE EVERY MAN THY EAR, BUT FEW THY VOICE." Hearing the password, he briefly shows us a note with the DR. FOSTER nursery rhyme quote, and also mentions that the Hounds patrol Fifth Avenue the first and third quarters of each hour; time being somewhat variable in its in-game rate of passage, I found it easier just to avoid the dangerous streets altogether. The walkthrough was not quite right in one spot, at least for the IBM PC version - I couldn't ENTER BUILDING, but had to EXAMINE BUILDING in order to meet the gnome-like woman who sells us the fingerprinter. Careful notekeeping is valuable. Once we meet Emile Ungar, he tells us we can get a Fireman's ID from room 212 at W54-55; Morton Dorr is the name we will adopt. We must trip the latch to the room with the blade of a knife, which can be stolen from the restaurant, and as always it's easy to run into unwanted opposition if we get lost and wander around too much. It becomes apparent at this point that we need to round up the Fireman's ID, match Dorr's face, fingerprints, and chemindex, and obtain the entry permit. I managed to find legitimate sources of most of the information needed to finish the game, but had to rely on the walkthrough to learn that Clarisse is in the Library, in room 210, and that a certain Bible quote lets us ride an oversized Hound into the building. I'm sure suitable clues are buried somewhere in the code, but as the game doesn't actually track whether we've learned the necessary information, a priori knowledge can be exploited to finish the game. Once we find Clarisse, we must talk to her, give her a buttercup found growing in a desolate city lot to prove we are still Guy Montag behind our adopted identity, kiss her, and escape to the roof before Firemen break the door down. (Thanks, walkthrough!) She has the microcassettes, and needs our help to get them to a transmitter so they can be disseminated and made freely available once more. The trip to the transmitter is relatively action-packed. We have to fight a regular Hound on the roof - a couple of possible victory scenarios are written in, which is nice; it's still wise to SAVE GAME before taking the creature on. Various combinations of LEAP ON HOUND, HOLD HOUND, and so forth usually work to subdue the robotic beast. The Firemen burst in, too late to stop the transmission! And Guy and Clarisse both die at the hands of the burly, well-armed Firemen! It's a really nice serious sci-fi ending, offering credible hope for a better future even as our heroes sacrifice themselves in the present. I thoroughly enjoyed Fahrenheit 451 -- it's not perfect, but the game's rich detail and forgiving design (there are few long-term mistakes we can't recover from) makes its world well worth exploring. And I like to think that Mr. Bradbury must have enjoyed seeing his work come to life, using technology that would have seemed like pure science fiction when he wrote his classic novel thirty years earlier.